Ancestral Author helps you document your genealogical research by constructing fully hyperlinked Adobe Acrobat PDF files from GEDCOM files. Use text files and jpeg images to create illustrated books with chapters, descendant reports, ancestor reports, and name index. It is very simple to use, and creates high quality documents that can be printed, emailed, published on the internet, or sent to a service bureau for conversion into a bound book. Easily transform a ed GEDCOM into a PDF. 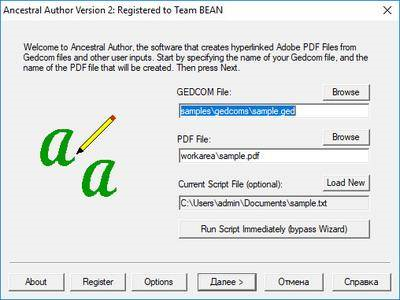 Just drag the GEDCOM onto the Ancestral Author desktop icon, and in a few seconds you'll have a fully hyperlinked and indexed PDF document. This makes it easy to view GEDCOMs ed from FamilySearch, Ancestry.com, Rootsweb, Genealogy.com, etc.